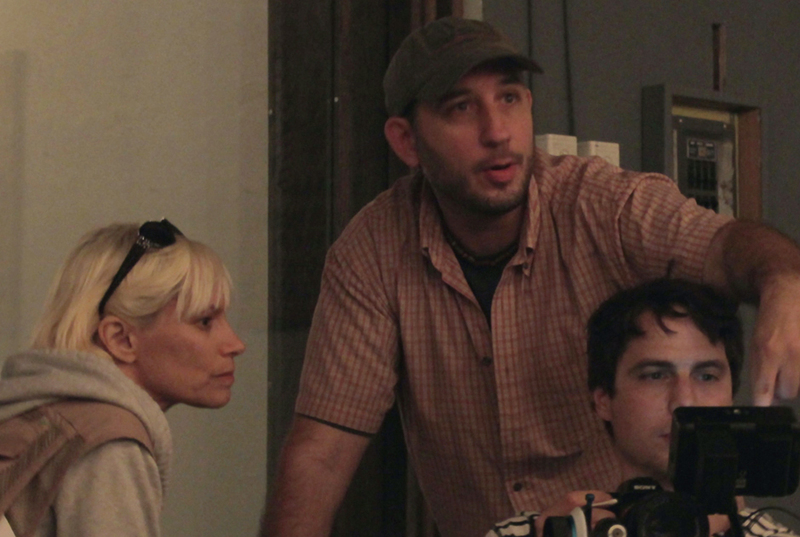 Me with Producer, Aviva Christie and Director of Photography Ryan Lightbourn. 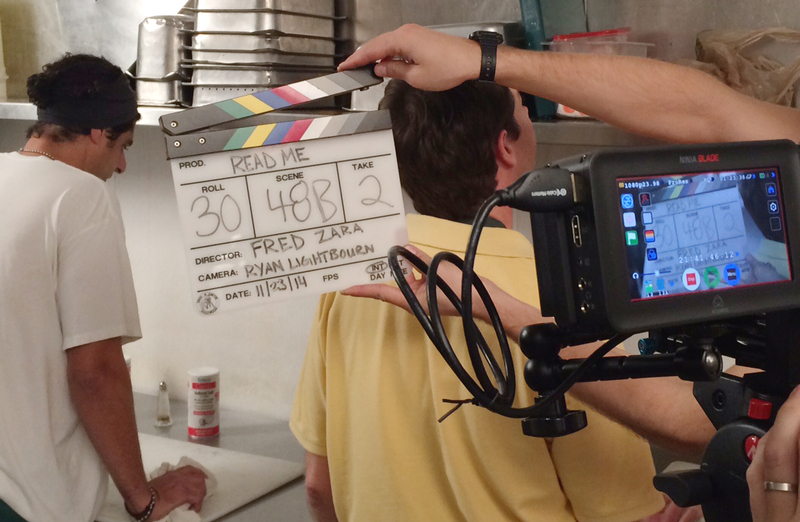 Last week we wrapped production on Read Me, which is my first narrative feature film as writer and director. Average Community, a documentary, was my first feature film and was its own huge undertaking, but a completely different animal. I prefer making narrative films, mostly because I like working with actors so much. I always said that I didn’t want to do my own narrative feature until I could do it right. At one point that meant: somehow get someone, or a group of someones to give me a ton of money, sign a bunch of contracts I didn’t understand, and have some producer tell me what needed to be changed in my story and who I could cast. Then along comes Kickstarter and a whole bunch of really great, low-cost digital cameras. Suddenly it seemed quite possible to raise just enough money to tell a simple story with a small group of people. So that’s what I did. I wrote about my journey with my Kickstarter campaign here, so I won’t go into that. 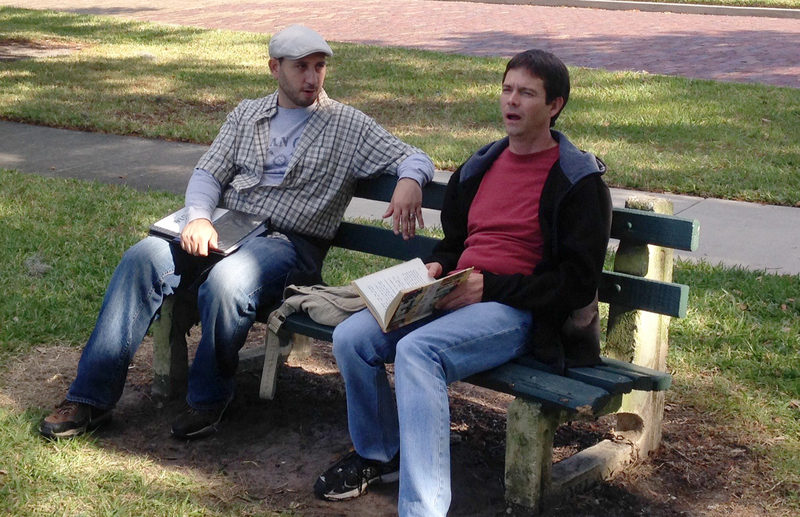 Actors: Robert Pino and Tim Williams on set for the last day of shooting. I created a pretty simple, yet personal story, about a guy who grew up with a reading disorder, and what life might be like for an adult who couldn’t read. I tied in a love story, and sprinkled in a little funny and bam, a character driven indie flick. Now this may be my first narrative feature, but I’ve been shooting one thing or another since I was about 10. I went to Valencia College for film production in 2000, did some student films, a bunch of short films and even worked on some other features under different directors. So being on set wasn’t anything new to me, but it definitely feels different when you are the writer and director, and the film is clearly as personal as this one is. I can’t say enough about how great the cast and crew were to work with. Starting with my producer Aviva Christie, whose favorite saying to me on set became, “If you’re happy, I’m happy.” She told me early on in the process that her main goal as producer was to make sure I was getting what I envisioned. And throughout the entire shoot she worked extremely hard to make that happen. Now, as a filmmaker, I strongly believe that you can never get too attached to your original vision. You have to stay open to new possibilities. Anything can happen when you’re shooting. Actors can bring amazing things to a scene or a character that you never thought of. You can’t let that stuff go to waste. Someone, anyone on set can throw out an idea for something that just works so well. Use it, thank them. It may not have been in your plans, but there are some wonderful surprises that come up when creating something in a collaborative group. So I planned out all my shots, blocked the scenes in my head, but once it was time for the camera to roll, I tried to stay open to whatever happened. Something could happen in the moment that may have not be part of the original plan, but would actually work better. However at the end of the shoot I honestly can’t believe how close we came to my original vision. Not to say that there weren’t some of those “wonderful surprises”, there were. But for the most part the film looked and sounded even better than I thought it would. I mean, did I really think we could actually pull off a feature film with only an $11,000 production budget? And yes, cast and crew did get paid. Way less than any of them deserved, but they all got something. Ryan Lightbourn’s camera work and Tommy Wingo’s sound were just amazing. What these guys were able to accomplish with me, Aviva and assistant director Joey Ross constantly on their backs, telling them we were running out of time, was simply outstanding. Tim and I chatting between takes. Then we come to the cast. I tried to write the lead character Clark as well as I could, however I wasn’t prepared for the depth that actor, Tim Williams, was able to bring to him. In just about every scene, Tim was able to add one of those “wonderful surprises” I talked about earlier. He was able to bring Clark to life in the most magnificent way. Self proclaimed theatre gal, Jamie-Lyn Markos, plays opposite Tim. Having never really done film work before, I’d have to say that casting Jamie-Lyn was what you might call a leap of faith. Throughout screen tests and rehearsals I was already really impressed with her. However once we actually went into production, it was like she went to a whole new place. She became her character Rachel, and it was really stunning to watch. And the scenes she shares with Tim are some of the most touching in the film. The rest of the cast, including Daniel Wachs, Robert Pino, Jeff Porter, Marty Stonerock, Thomas Dunn and everyone else really exceed expectations. They all brought their A games. Please check out the entire cast here. Aviva put together a wonderful crew. Hard working, friendly and really eager to help in any way. It was a thrill to work with all of them these last few weeks, and I am incredibly indebted to each one of them. Also, it was so nice that Margi Angyal Dawson, a Kickstarter backer and an old friend, was able to stop by and lend a hand. Fred, I’m so thrilled for your completion of the film. Can’t wait for the film to be viewable and see it all come to life. Congratulations on a job well done and to your team! Thanks so much for the support Jill!